PHONECO has a variety of old Telegraph items available. Porcelain knife switch. Double pole single throw 2-1/2 inch by 2 inch shown. We have other types available. Various types of telegraph relays. Double throw telegraph switch with black porcelain base. Single throw telegraph switch with black porcelain base. No. 975B arrestor used for protection against lightning. Porcelain - by Reliable Co.
58A Protector for protecting substations from high current by Western Electric. Reliable Electric carbon block fuse with porcelain fuse. 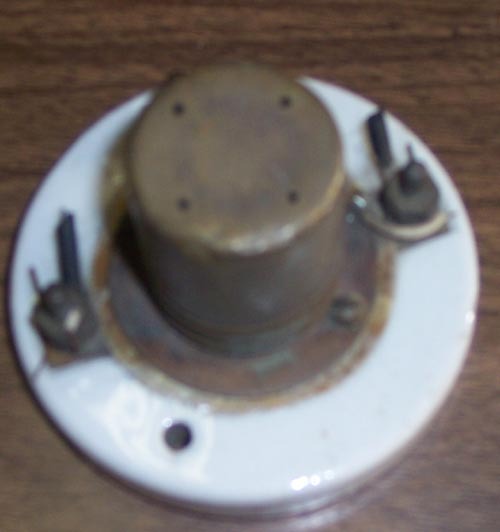 Round porcelain 49B protector/lightning arrestor. No name - may be Cook Elec. Porcelain fuse holder 660W 250V by Arrow. Screw hook with porcelain insulated. Angel screw with porcelain wire holder. Pierce wire holder 3" & 2". Reliable Electric Co. Chicago. No. 1000. Telephone line protector. No. 511 arrestor used for protection against lightning. Porcelain - by Reliable Co.
No. 975 arrestor used for protection against lightning. Porcelain - by Reliable Co.
Screw hook with porcelain insulated. Shorter thread verstion of SHWPI 1-1/4". Automatic Electric porcelain fuse made in USA. Fuse is under the cover. Has 3 terminals. There is a chip on the back which doesn't interfere with its operation. Large porcelain protector patented Dec 19, 1905 in USA. Walnut. May date after 1805 (between 1806 and 2009) Suspect English/British/Irish unusual Telegraph. Wood spindle for glass insulator. Wood telephone pole insulator holder bracket. Price for one each.